Marsden and Slaithwaite rail campaigners have been up in arms over TransPennine Express rail services. From: David Hagerty, Slaithwaite & Marsden Action on Rail Transport, Wood Street, Slaithwaite, Huddersfield. THE easiest way for Rob McIntosh to dispel fears that communities are being short-changed would be to talk to passengers in those communities – places like Slaithwaite and Marsden – to set out precisely what the TransPennine Route Upgrade will deliver for them (The Yorkshire Post, December 14). Over the past six months, Slaithwaite has been the worst station in the entire country, bar none, for punctuality and reliability; this is thanks to a railway industry which has shown itself to be prepared to sacrifice our already inadequate hourly train service in an attempt to minimise delays to much more frequent express trains. The Yorkshire Post says: When will you act, Minister? The railway industry, collectively, has forfeited the trust of passengers in the Colne Valley. Vague generalities about “transformation” and “improvement” do nothing to start restoring that trust, and ware entitled to be sceptical. All we are asking for is that TRU delivers for us a half-hourly service. It shouldn’t be a big ask. Just about everywhere else in the Leeds and Manchester city regions, including stations with far smaller passenger numbers, either already has two trains per hour or has a firm commitment to this in the existing franchise agreements. 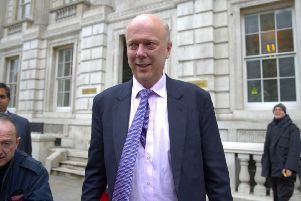 When we met Chris Grayling, he was unable to confirm what improvements, if any, the Trans-Pennine Route Upgrade would provide for Slaithwaite, Marsden and the other intermediate stations between Huddersfield and Manchester. What we don’t want is for passengers at the Colne Valley stations to endure years of disruption, only to end up with exactly the same inadequate and infrequent service as we suffer now. Unfortunately Mr McIntosh does nothing to dispel those fears. From: Mike Padgham, Chair, Independent Care Group, Scarborough. OVER the Christmas and New Year period, it is easy to forget those who won’t get a break to be with family and friends. Carers, both paid and unpaid, join doctors, nurses and emergency services in putting the safety and care of others ahead of their own festive enjoyment. We owe them a huge debt of gratitude. And whilst we are busy with last-minute shopping and celebrations, we must not forget those who might not be able to enjoy a special Christmas this year. Some, who have no family or friends living close by, might spend this time alone. Please look in on them – you might be the only contact they get. As we look forward to 2019, I hope that social care will at last get better recognition and support, for the sake of those who work in the sector and those who benefit from their compassionate care. I FULLY endorse the views of two correspondents about the now common practice of consuming alcohol and eating food during theatre performances. A common practice, also, is that as soon as the glass is well down, the mobile phone gets waved about in the darkness of the auditorium. We found that stewards tour the auditorium at the Leeds Arena selling bottles and crisps from trays as well. When one has to pay £7, on top of the face value, just to get the ticket printed, one expects better than constant disturbance. In our experience, the West Yorkshire Playhouse was by far the worst, with people often arriving at their seats some time after the start of the performance. Haplessly, they would pause and apologise to each person, on their way to their seat – usually to explain how long they had to wait to get served. Perhaps a valid response to such boozers, unable to last and hour without a drink inside them, might be to apologise to them, as they pass, that one’s entertainment is interfering with their drinking. Or, in the case of much of the WYP’s recent repertoire, to stay at home and read the book! From: Christopher J Liddle, Oakdale, Harrogate. HARROGATE needs a Crown Post Office as much as Scarborough (The Yorkshire Post, December 15), but we are being railroaded into relocating it to WH Smith to increase footfall in their upstairs book area. Access is poor for anyone with mobility difficulties and there is no convenient parking nearby. I attended the consultation meeting only to discover that the vacated building would be placed on the open market, thus with no guarantee as to its future use. We have many complaints about empty shops. Let’s not create another one whilst destroying a perfectly good, well used facility. From: Robin Ashley, Sheffield Road, South Anston, Sheffield. I UNDERSTAND the average salary for the CEO of a UK-based charity is £185,000. Similarly the average salary for a CEO in the public sector is well over £100,000. must attract the right people. Bearing in mind the salary of the Prime Minister, can we perhaps assume that this is pitched at a level to attract the wrong sort of people? I AM pleased that cycling’s Geraint Thomas has been voted the BBC’s Sports Personality of the Year for his triumph in the Tour de France. After all the controversy, he is a new face for people to have trust in.